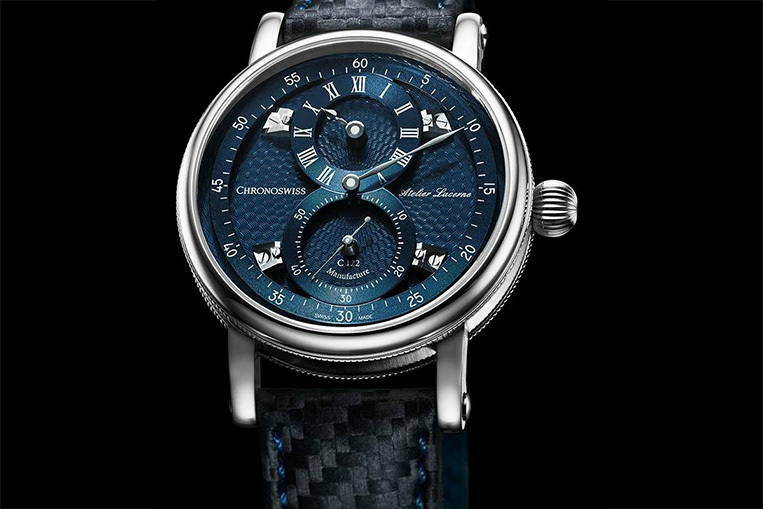 Chronoswiss Sirius Flying Regulator | Watchfinder & Co.
German watchmaker Chronoswiss has released the Sirius Flying Regulator, to be unveiled at Baselworld 2016. Using the high quality, in-house calibre C.122, the watch features a ‘flying’ minute dial and two sub-dials for hours and seconds. The classically simple case is available in red gold, stainless steel or steel black DLC, and has a diameter of 40mm. A notched edge and onion crown are in keeping with the rest of the Chronoswiss stable, while the guilloché design on the dial—specially designed for this line—has been enhanced by electroplating, and gives extra depth to the deep blue colour of the watch’s face. The piece is set off by the intricately plaited pattern on the strap, which comes in alligator leather or calfskin.